Remote Desktops Services (RDS), Citrix Xenapp, VMware Horizon and other Virtual Desktop Infrastructure (VDI) technologies can be great for centralizing and securing application delivery but they can be slow and aggravate end-users too. 50% of VDI implementations fail due to poor end-user experience or cost overruns due to a lack of capacity management. As organizations leverage more remote application delivery they must be responsible for the performance and end-user experience – care must be taken to ensure up-time and responsiveness. Measuring traditional performance metrics at the server can be OK but to ensure fast VDI and RDS environments, architects must measure Remote Desktop Protocol session performance end-to-end. Exoprise recently added support for RemoteApp testing. Launch any published application, recognize when the app is fully available and benchmark its performance. Just a few clicks to setup. 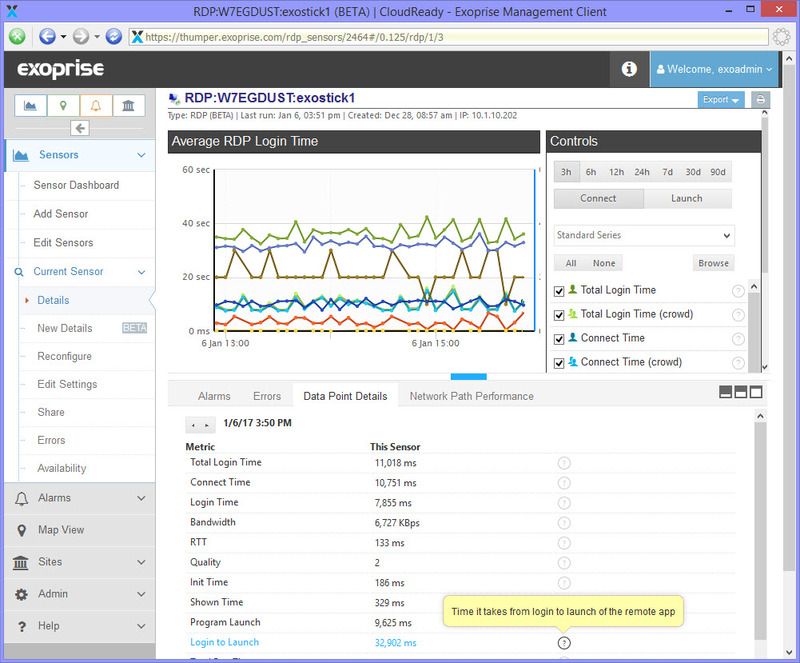 Exoprise CloudReady® gives you the insight you need to monitor and manage availability for your RDS, XenApp, Horizon or other VDI environments. Know about problems before your users do. Perfmon counters are OK for the servers but you need to be notified of end-to-end problems before they affect your end-users. Get notified of errors, slow downs and emergencies in real-time with the automatically configured and calibrated alarms as you deploy. Monitor from inside your firewall or outside on one of our Public Sites. All from easy wizard-driven interfaces. Slow Remote Desktops? Lousy Launch Times? With the Exoprise CloudReady RDS/RDP monitoring solutions you can identify the conditions that lead to slow desktops and poor application response. Typically its the result of a insufficient network and/or capacity planning so you must continuously measure and correlate network changes with end-to-end VDI response. When you make changes you need to have a consistent repeatable workload to test whether or not the changes you make – server, client, or network – have improved the situation or made it worse. The best way to do this is to have a consistent repeatable “workload” for your remote services. The Exoprise CloudReady RDP sensor makes it quick and easy to deploy a repeatable synthetic remote session with application launch. No scripting required, no complicated controllers to install. 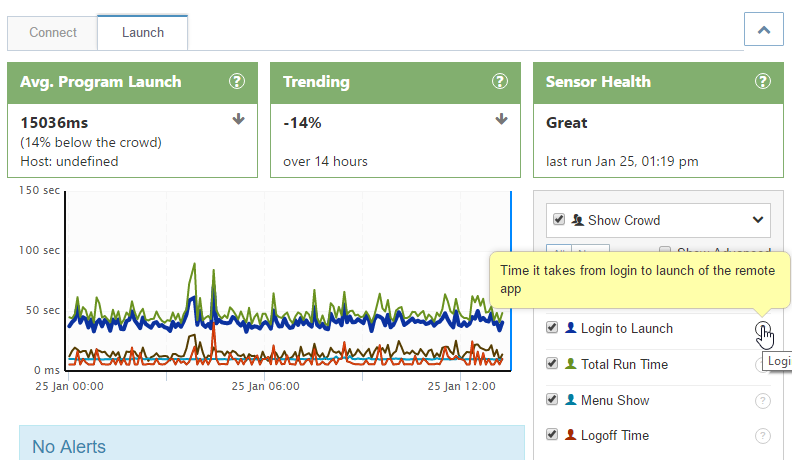 Detect slow logon performance before your users do by continuously monitoring Remote Desktop sessions end-to-end. Get proactive notifications of slow application launch times which could be due to the insufficent resources or network capacity. CloudReady RDP Monitoring is more than a single-use point-in-time testing or load simulation tool. CloudReady covers the full range of monitoring capabilities across SaaS services, API Toolkits, Remote Desktops and more. Compare your Remote Desktop environment performance to other environments. Anonymously. See how your VDI performance stacks up. Whether its for tuning capacity or troubleshooting a recent change, establishing baselines for your VDI/RDS performance is critical. No servers to setup, no databases to maintain. Get started in minutes and integrates with your existing systems management solutions like Microsoft Systems Center, Operations Manager, Splunk and more. Automate deployments with our PowerShell API.